Let me say up front that I'm a fan of traditional Windows 10 UWP interfaces, as used in - for example - 8Zip, but there's still arguably a place for wizard-style interfaces as here in Zip Opener. Just some big buttons to kick things off and you're done. No options, no complex views. So it all depends what you're after in an unzipping utility. This does have the additional benefit of being free to download, though the ads would drive you mad if you used it regularly, so maybe factor in the £1.49 IAP to zap them? 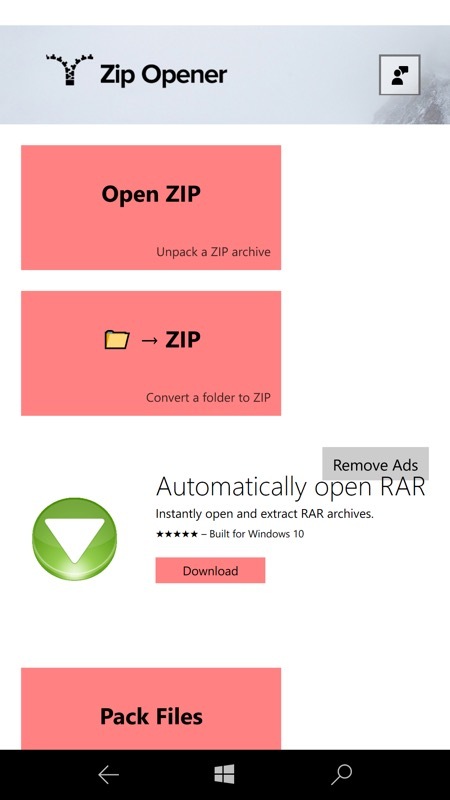 Zip Opener is your simple answer to annoying file problems. How often do you get a file you need that is hidden behind a cryptic label? It's usually ZIP compressed, but there is a myriad of other file compression methods - only nerds can keep track of them all! Well, that's why we made Zip Opener. It's small and fast, so it doesn't clog up your computer, yet knows how to open all sorts of file archives. And if you need to save space, it will even automatically compress files for you. 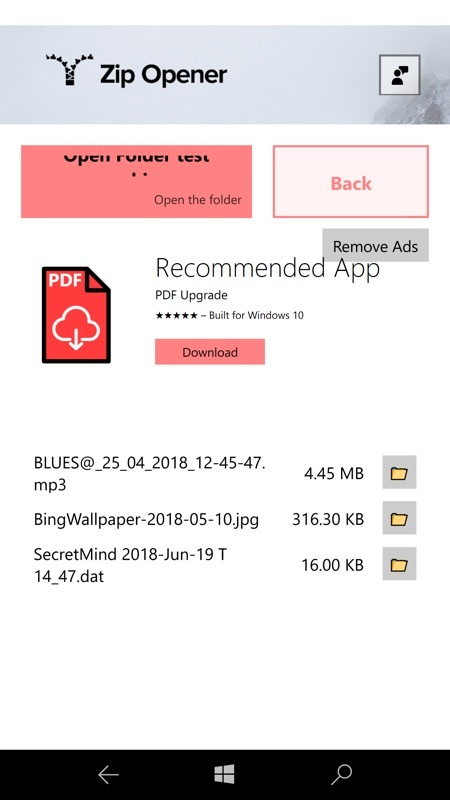 So next time you encounter crazy file extensions like ZIP, RAR, TAR, 7Z, GZIP2 and BZ (amongst others) we have you covered with a single app: Zip Opener. It does one thing and does it well, won't take up a lot of system resources. 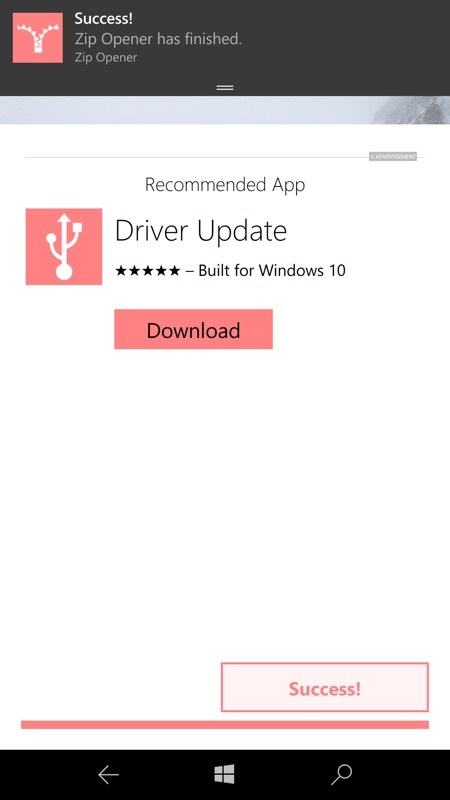 Small app size saves you drive space so you can keep downloading. Made for normal people, not nerds: one-tap operation. Who likes to wait? No one, that's who. Zip Opener is SPEEDY. No junk, toolbars or spam - made in Canada. Yes, yes, the ads are confusing - zap them if you want to carry on using the tool. Here I'm extracting a local test archive to the folder of my choice. In this case, you get a 'toast' when the extraction has finished and tapping on the 'Success' button gives a listing of the files obtained. All very minimalist, and you can 'pack' files in much the same manner. You can grab this in the Store here. Just be careful not to tap on those intrusive ads until you've paid for them to go away!